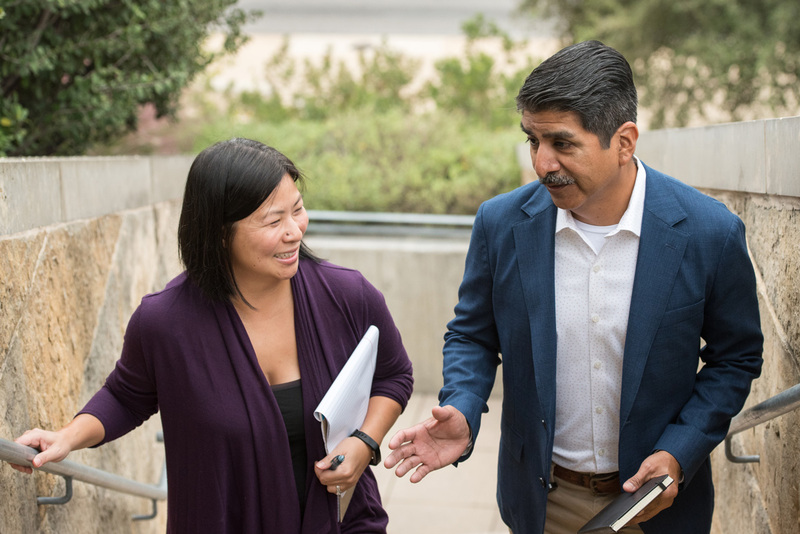 ICMA has released a number of resources that help paint a comprehensive picture of how projects are being financed today and options that local governments are exploring. This 2015 white paper jointly released by ICMA and GFOA, Municipal Bonds and Infrastructure Development—Past, Present, and Future, by Justin Marlowe, points out that more than 90% of state and local capital spending is financed via municipal bonds and reinforces the need for continuing the federal tax exemption for these bonds which saved states and localities over $700 billion in interest expense between 2000 and 2014. While municipal bonds are central to infrastructure financing, in its 2017white paper, Public-Private Partnerships (P3s): What Local Government Managers Need to Know, by Lawrence Martin ICMA explored the various types of P3s, along with risks, challenges, and opportunities presented by these arrangements. 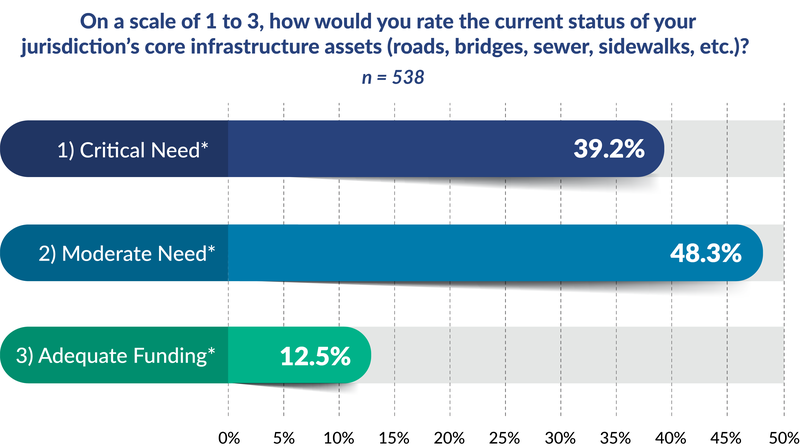 The graphics below come from a 2016 survey conducted by ICMA that included seven questions on how local governments pay for and assess their infrastructure needs. 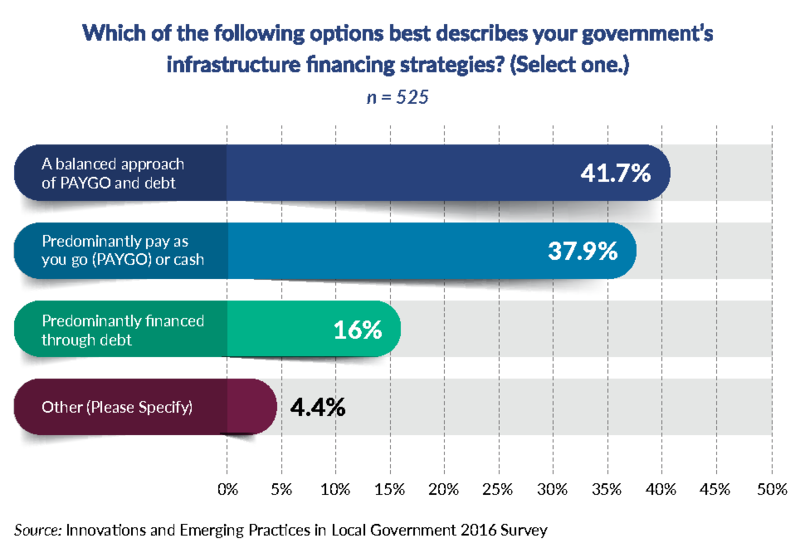 For a real meat-and-potatoes guide to infrastructure assets and financing, check out this resource released by ICMA and GFOA last year: Infrastructure Financing for Local Government Managers, which outlines traditional and emerging funding sources, financing mechanisms, and financial arrangements.